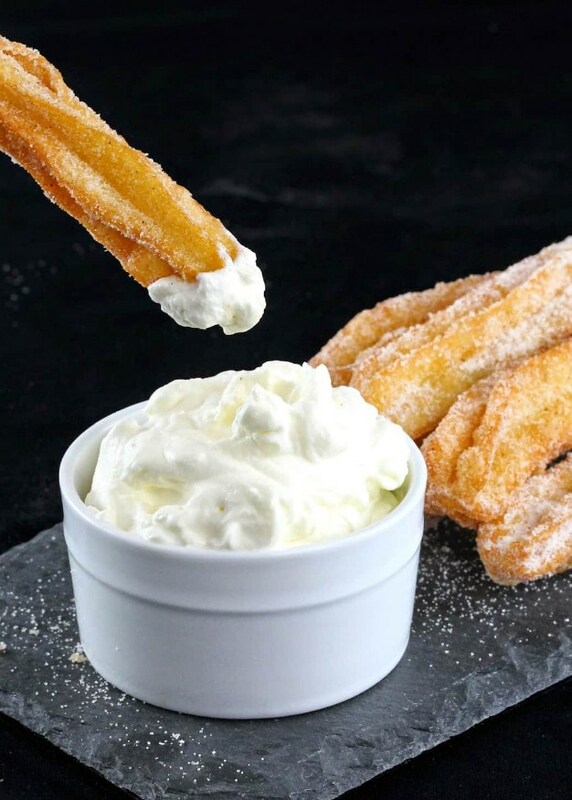 There's nothing quite like freshly fried Homemade Mexican Churros. It's flaky and warm and practically melts in your mouth! Heat the oil in a large pot to between 350 and 375 degrees. Meanwhile, make the dough by heating water, butter, vanilla, and salt in a large saucepan. Once the butter is completely melted and the mixture begins to simmer, remove from heat and stir in the flour with a wooden spoon. Add in the eggs one at a time, stirring and mashing the dough together until the egg is fully incorporated. Transfer the mixture to a large pastry bag fitted with a large star-shaped tip. Working in batches of 3 to 5, pipe the dough directly into the hot oil using scissors to trim to the desired length. Cook until dough puffs and turns golden brown, turning halfway through so all sides evenly cook. This should just take 2 to 4 minutes total. Carefully remove churro from oil using tongs and place on a paper towel-covered plate to drain. Once the churros have cooled enough to handle, put the sugar and cinnamon into a resealable plastic bag. Put the churros in one or two at a time and gently shake until churro is coated.